If you were to ask people what the most striking man-made landmarks in the world are, many would probably answer “the Eiffel Tower” and “Big Ben”. Almost everyone has at least seen pictures of these two before, and their striking silhouettes have graced many a postcard and travel guide. Aside from being famous structures, these two have virtually nothing in common, and are in fact in different countries, yet a comparison between them seems only fitting…and here it is! The Eiffel Tower is an iron structure located on the Champ De Mars in Paris, France. Given the nickname, La dame de fer, or The Iron Woman, the Eiffel Tower was named in honor of its designer, Gustave Eiffel. The Eiffel Tower was erected in 1889 as the entrance arch of the World’s Fair, and it is currently the tallest building in the city as well as one of the most recognizable architectural structures in the world. Big Ben is the name of the immense bell of the clock located at the north of Westminster Palace in London, although many people refer to the entire clock tower by that name as well. The Big Ben is the largest four-sided chiming clock in the world, as well as the third-tallest clock tower. 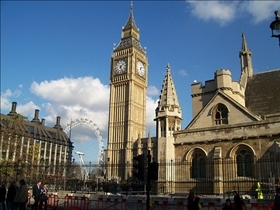 Big Ben was first pressed into service on May 31, 1859, and celebrated its 150th anniversary in May 2009. The Eiffel Tower stands at 324 meters (1,063 ft), making it about the same height as the typical 81-story building. For several years, it was actually the tallest building in the world, a status that was taken only in 1930 by the Chrysler Building in New York City. It is still the second tallest building in France, with the tallest being the Millau Viaduct, which was built in 2004. Big Ben is characterized by four large clock faces, which initially gave the tower the distinct of being the largest four-faced clock in the world. As mentioned previously, Big Ben is still the largest four faced chiming clock in existence. The hour hand in each face is 2.7 meters (9 ft) long and the minute hands are 4.3 meters (14 ft). The Eiffel Tower has been visited by well over 200 million people since it was built, and it is still seen by millions of people every year. In 2006 alone, the tower was seen up close by no less than 6.7 million people. 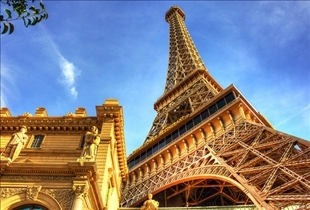 The Eiffel Tower is in fact one of the most-visited monuments in the world that charge an admission fee. Although considerably less popular, Big Ben is quite the tourist attraction in England, and it is widely considered to be the most popular landmark in the country. Big Ben also has the distinction of being the “Most Iconic Film Location” in London. Which monument is more exciting to visit?